After Teresa filed a report against her farm employer for sexual assault, he asked her how much money it would take for her to retract her statement. In the spring of 2014, Teresa (not her real name) was attacked by her boss on his farm in British Columbia. On the day the assault occurred, the boss sent Teresa’s male co-workers to another farm for the day, leaving her and another female farm worker behind. While they were trellising grape vines, the women ran out of twine. Teresa’s boss told her to come and get more twine inside a shed, where she says he forced his mouth onto hers and began grabbing her inappropriately. She managed to shake off his grip and run back to her co-worker in the vineyard for support. It was her word against his, and the Crown decided there wasn’t enough evidence to proceed with the charges. In Canada, 46 per cent of women survivors don’t even report sexual assault because they think there is insufficient proof. Teresa is a single mom from Baja California, Mexico. Since 2012, she has been supporting her parents and two daughters by spending up to eight months each year on Canadian farms through the Seasonal Agricultural Worker Program (SAWP). Teresa was concerned that speaking up about the sexual assault might hurt her and her female co-worker’s future job chances. Canada’s SAWP is the main agricultural stream of the Temporary Foreign Worker Program. It began in 1966 in response to lobbying from farmers and that year in Ontario, 264 Jamaican workers were hired. Since then, the program has expanded to all Canadian provinces, bringing workers from Mexico and 11 Caribbean countries. In 2017, approximately 40,000 workers came to Canada as a part of the SAWP — around 7,500 to British Columbia. Of those, less than four per cent were women. The structure of the SAWP heightens the power imbalance between workers and employers, amplifying women’s vulnerability to sexual assault. Work permits are tied to a specific employer, so getting fired typically means getting deported. Workers in abusive workplaces often have difficulty transferring to a new boss. To be rehired the following season, a farm worker must receive a positive evaluation from their employer. The SAWP requirements effectively deter worker complaints about labour practices, housing conditions, workplace injuries or violence. The SAWP contains no pathway to citizenship, even for men and women who have worked in Canada for decades. Workers and critics of the program argue that permanently categorizing migrants as “non-citizens” means they have fewer rights and protections than Canadian workers. The SAWP has been a boon for growers, who have access to a seemingly unending pool of workers whose urgent need for income makes them unlikely to dissent. While sexual assault in general is the most underreported violent crime in Canada, a precarious citizenship status presents an additional barrier to reporting for migrant women (both undocumented and government-authorized). Teresa said a fear of deportation was a major factor in deciding whether to report their assaults. She knew of other workers who had been sent home for complaining to authorities about living conditions, workplace injuries, bullying and harassment. Despite all the pain she has experienced in Canada, Teresa says thinking about her own daughters gives her the strength to keep going. As part of a cultural shift toward gender equity, we need to revamp Canada’s laws, institutions and policies to better protect all women, including farm workers. The B.C. government has promised to establish a registry that could help prevent migrant workers from being charged illegal recruitment fees, which is a positive starting point. As supported by U.S. research on sexual assault services, provinces could also set up anonymous, toll-free and multilingual crisis hotlines for workers, including those who are undocumented. To address the multiple barriers faced by migrant farm worker women to health care, researchers have recommended enrolling workers in provincial health-care plans instead of private insurance schemes. Free legal services and English-language classes could also strengthen women’s ability to assert their rights. Workers should have the right to a fair appeal process before deportation. Ultimately, the Canadian government should eliminate tied work permits and provide migrant workers with full immigration status, two steps that would immediately lessen the disproportionate power of the employer. Such changes would also go a long way toward ensuring that those who do the vital work of growing the food we eat receive the respect, freedom and dignity they deserve. Weiler, Anelyse. 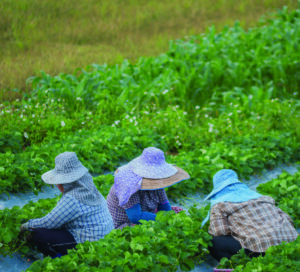 “Migrant Farm Workers Vulnerable to Sexual Violence.” The Conversation. May 1, 2018. Accessed May 30, 2018.